We offer fun, nature-inspired programs for Cub Scout Webelos. Dens can explore the natural wonders of the Shaw Nature Reserve in all seasons. Some programs are aligned with scout badges and meet the necessary requirements for each badge. See each program's description for details. Discover and learn with us! We encourage small troops/dens to contact other scout groups within their area to schedule a program together. Each participating scout will receive a one-of-a-kind Shaw Nature Reserve patch! Spring 2019 registration (March-May 2019) is now open. Saturdays 10 a.m.–noon or 1:30–3:30 p.m. Note: Monday and Tuesday afternoons are also available in May only. Early school release times may be available upon request. Please let us know how we can accommodate your group by calling the Scout Instructor at (314) 577-9473 x 76357 or at scoutprograms@mobot.org. Click the “Register Online” link below. Choose your date, time and program location. Fill out the online registration form and write in which program you’d like to complete with us. Choose whatever program you like, as long as it fits the location and the correct time of year. For example, "Trees" for Girl Scout Cadettes is only done at Shaw Nature Reserve, so be sure to choose a program slot that says "at SNR" in the title. Pay online by credit card. Your card is charged at the time of registration. You will receive an email confirmation from the Scout Instructor within 3–5 business days. Your program is not confirmed until you receive this email. If you don't receive a confirmation, please contact the Scout Instructor at scoutprograms@mobot.org. REGISTER ONLINE — You will be able to view available dates, times and locations for group programs here. You will be prompted to type in which program you would like to complete during the registration process. Programs must be scheduled 3 weeks in advance. The program fee is due at registration by credit card only. Before you register, please check with your troop that they are available on the chosen date and location. Programs which are rescheduled by the troop leader less than 30 days from the date of the intended program are subject to a $25 rescheduling fee. Questions? Check out our Frequently Asked Questions page. If you need additional assistance contact the Scout Programs Instructor at scoutprograms@mobot.org or (314) 577-9473 x 76357. These unique scout group programs have been designed to offer more nature and STEM-based programming to scouts interested in learning more about the outdoors. These programs have not been aligned with any scouting awards, yet offer opportunity for discovery and exploration! Each program is made appropriate for Girl Scout Daisies through Cadettes and Cub Scout Bears and Webelos. Join us in front of a warm fire with some hot chocolate to learn about winter animal adaptations and feeding behaviors. Afterwards we'll make treats for Shaw Nature Reserve's animals to hang along the surrounding trails. We'll take a short night hike to search for animal tracks and other signs of winter activity, too. This program meets the requirements for the Daisy "It's your story, tell it" journey Birdbath Award, but can be adapted for all scout levels. Program length is 1.5 hours. This program is available in December. Head for the river! Visit a dry riverbed to collect and learn about important geologic specimens that we use every day. We will conduct various tests to look for Missouri minerals. Hike to an overlook in the foothills of the Ozarks to learn how they were formed and about the fossils that were left behind. In January and February, part of this program is conducted inside and includes hot chocolate! 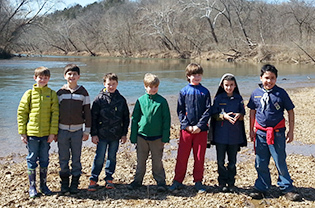 This program completes all requirements for the AOL/Webelos Elective Adventure Earth Rocks! This program goes towards completing the "Science Everywhere" Nova Award for Cub Scouts. Program length is 2 hours. This program is available July-September and December-February. Discover how to identify Missouri's native trees as well as plants. Use this skill on a hike to find wild edibles. Scouts will also examine tree cookies and learn the science behind dendrochronology, the study of growth rings in trees. When this program is completed in January and February, scouts will observe how maple syrup is made! This program completes requirements all of the AOL/Webelos Elective Adventure Into the Woods. This program goes towards completing the Dr. Charles H. Townsend Supernova Award for Webelos. Program length is 2 hours. This program is available January–February and July–September.